Tom and I LOVE what we get to do. Truly, EVERYONE has an interesting story to tell and every project has its unique joys. But every once in a while, a project comes along that smacks us upside the head (in a good way). A project that, in the doing of it, becomes part of our narrative, part of the story of our career as personal historians, that we will never forget. It’s a story we tell often to convince others, and remind ourselves, of the power of story. When Eveline Bruenger came to meet with us early last year, she had been battling lung cancer for three years. She had written a draft of her life story, enlisting the help of her trusted friend Cathleen, and brought us a box of lovely photos to scan for use in her book. Eveline was an extraordinary woman. Born in Germany in 1934, she survived the devastation of World War II and in 1958 came to America with her husband Fred (“Fiti”). Both chemists, they obtained work at the University of Utah and enjoyed distinguished scientific careers. They were passionate about the outdoors and hiked all over the world, from a yearly trek through their beloved Grand Canyon to Everest, Annapurna, and Kilimanjaro. Eveline continued to hike after Fred’s death in 2007. Over the next month after our first meeting, we worked on the design while Eveline and Cathleen continued to refine the narrative. Although she was very ill, Eveline was determined to see the project through. 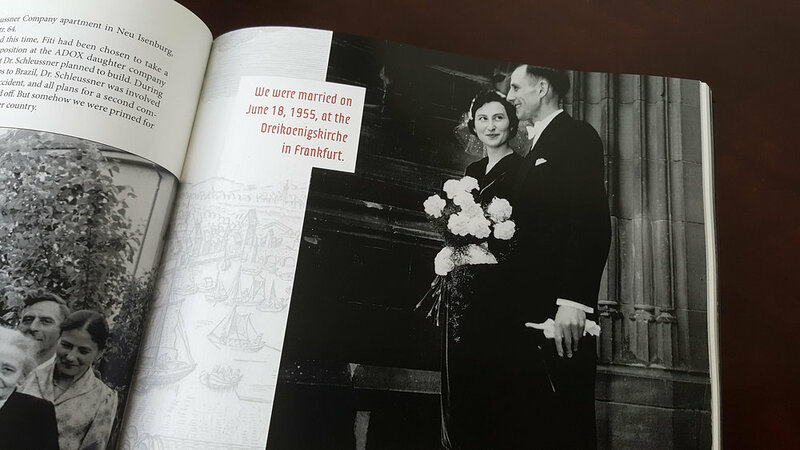 We knew that her time was limited and we worked together as quickly as we could to complete the book. One morning in early April, Cathleen’s number lit up my phone. I answered the call enthusiastically, having just finished the layout the night before, and I was excited to show it to them. But Cathleen had bad news. “Eveline has taken a turn for the worse.” She explained that Eveline had grown weaker over the previous few days and was unable to get out of bed, drifting in and out of consciousness. She wasn’t sure Eveline would be able to respond or would even recognize us, but thought we could at least try to see her. Later that morning I met Cathleen at the assisted living facility, book draft in hand. We were shocked to find Eveline not in her bed, but in the dining room, sitting up at a table with a dish of ice cream. She beamed at us and motioned for us to join her. For the next hour Eveline pored over the book, eyes shining. She was too weak to say much, but nodded to me with a beatific smile over each page, tenderly touching photos of her parents and her beloved Fiti. She radiated with palpable joy and peace. Later that afternoon, Cathleen called me to say that Eveline was again in bed and unresponsive. A few days later, she peacefully passed away. I will always be grateful for that extraordinary hour with Eveline. It was a sacred window of time and space that I felt humbled and privileged to share. This book was her last “hike,” and I’m so happy that she was able to see it through. On the cover are Eveline and Fred, camping in Southern Utah shortly after they came to America. Eveline drew pictures of her childhood room (also the kitchen) in Frankfurt after the war. One of the most romantic wedding photos I’ve ever seen. Each family member shows their joy with a different expression. Eveline looks up adoringly at Fiti, and he looks as though he is just about to kiss her. A closeup of this photo reveals shrapnel damage in the church, ten years after the last bomb fell on Frankfurt. 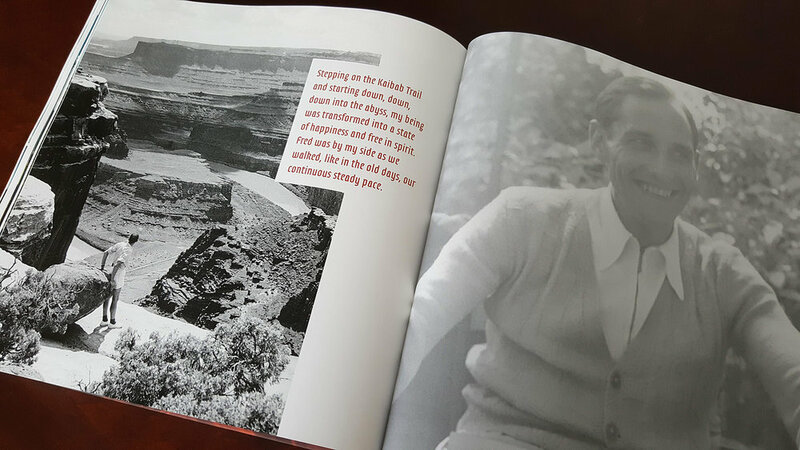 Eveline and Fred hiked the Grand Canyon together every year from 1959 to 1991. A chemist for 40 years, Eveline rose above the challenges of being a “woman scientist” in a man’s world.